I love renaissance music. So it was natural to be drawn to the composers who set Ronsard’s texts. It’s been a voyage of discovery, for few of these composers are at all famous today, and many are unknown outside of (even inside of?) France. But that does not mean their songs are bad or uninteresting: in fact, there is a flowering of madrigal-style song-settings in France at this time which matches the similar florescence in Italy and England, though with its own individual style. So, here you will also find what I hope is a multi-faceted guide which different people can access in different ways. I’ve included scores for those who can read music; links to scores you can ‘play’ through with a website synthesising the music for you, for those who want to hear the way the music sounds; excerpts from recordings which will give a better idea of how the songs come across, and the range of approaches to them; linked to the recordings, details of the CDs they come from to help you find more; and pictures of (some of) the original 16th century prints in which the music was first published, again with links to a range of online sources where you can explore further – whether to transcribe the music expertly, or to admire the lovely old printing in a much less sophisticated, but in my view no less important, way! excerpts from recordings of some of the songs available on CD, so you can from some impression of what they sound like in performance, and to encourage you to buy/download the CDs! I have also included a (short) list of settings I have not included, which I have found attributed to Ronsard in print or online, but which clearly are not Ronsard’s own poetry. For a poet who wanted (we might guess) the word to take precedence over the music, it is unfortunate that Ronsard’s time favoured not the clear declamation of a single line of text, but the interweaving of multiple voices and lines of poetry. The single line came back to favour with the arrival of Monteverdi and his seconda prattica but not till after Ronsard’s time. Ronsard lived through the last great flowering of renaissance polyphony, although alongside it (and leading towards Monteverdi) the madrigalists were developing polyphony towards greater expressivity of the text. Looking back from the 21st century, we see Lassus, Victoria and Palestrina as the three great composers – and mostly achieving that standing through their religious music, and their work in Italy and Spain. Alongside them the Italian madrigal was taking off, though its composers are generally thought less ‘great’, and in England there was even a tradition of lute songs – exactly the sort of thing Ronsard might have envisaged. England’s taste was to some extent shared with France: the early generation of Ronsard-composers uses a chordal style where all the voices sing the same syllable at the same time, which is great for hearing the text but definitely not how things were moving in Italy. In northern Europe – Germany and Flanders, and then later in France – a host of ‘lesser’ composers were following the lead of the Italians, and having all the voices singing the words but in an overlapping web of sound and sense which does not convey the text so directly. That isn’t to say that the settings of Ronsard’s poems are dull or second rate. The great Lassus set several texts (or parts of texts); and Jean de Castro, Philippe de Monte and others were in many respects the equals of their more famous contemporaries. But they are definitely off the beaten track for today’s listener! And this group of composers were mostly from Flanders rather than France; a handful of settings by the ‘older generation’ of French composers (Janequin et al) were from Ronsard, but the bulk of settings (from the 1570s onwards) are in ‘Ronsard collections’ published by composers who may have used the Ronsard theme to get their work published. Were they ‘provincial’ composers, minor figures? The title pages of their works suggest as much: la Grotte, ‘valet de chambre & organist to the king’, Bertrand ‘native of Fontanges’, Boni ‘from St Fleur in Auvergne’, Maletty ‘native of St Maxemin in Provence’. And then there is Fabrice Marin known as Caietain, the ‘man from Gaeta’ in Italy. 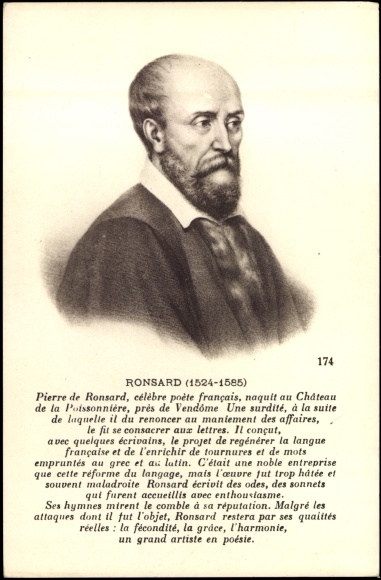 But remember, Ronsard published his works consistently as “P.de Ronsard Vandomoys’ (of Vendome) until the 1560s, so it is as likely that these composers are naming their birthplaces for similar reasons rather than to indicate their they are ‘provincial’; and Ronsard himself held a minor court post like la Grotte. What did Ronsard want from the musicians who set his texts? Let’s start with the earliest song-settings of his poetry, published as an annex to the 1552 edition of his Amours. What inspired this, and why was the experiment not repeated? Scholars have often pointed to the monopoly gained by Le Roy & Ballard on music printing just afterwards; but that would not have stopped a similar form of publication. I think Gilbert Gadoffre came closest, though he is cynical. He points out that Ronsard opened his first publication, the Odes, with scathing remarks about the courtiers who “admire only a petrarchan sonnet, or some pretty song of love”. Two years later, Ronsard not only published a huge book of petrarchan love-lyrics, but also offered musical settings. Why? Because at court, his major competitor was Mellin de Saint Gelais, who had a fine voice and who endeared his poetry to the court by singing them to his own accompaniment. Ronsard, though his Odes had impressed intellectually, needed to find a way in to the hearts of the court: the Amours worked within the prevailing taste, but Ronsard (half-deaf and perhaps lacking the voice to sing his own poems) needed to find another way to get people singing his poems. With the poems carefully labelled so that almost all the Amours could be sung to one of half a dozen tunes, Ronsard achieved his goal, with his poems on the lips of all the court. The loss of the printing monopoly would hardly have stopped Ronsard repeating the experiment with a different publisher, were it needed. But it wasn’t. There is no repeat of the Supplement, because there was no need. Not only was everyone singing his poems already, as we know ‘popular’ settings were springing up (the ‘vau-de-ville’) and, more importantly for Ronsard, composers began to set his poems by choice, culminating with the ‘divine Orlando’ (Lassus) publishing two volumes at the start of the 1570s focused heavily on Ronsards poetry. That led in turn to the collections of the mid-1570s which used only (or said they used only) Ronsard’s poetry throughout. Note that the settings in the Supplement are accompanied by lengthy lists of other sonnets that can be sung to the same tunes. Which tune depends on the precise metrical form of each poem; but for our purposes the interesting thing is that Ronsard’s view of the marriage of verse and music apparently did not, at least in 1552, extend to a madrigal-like ‘illustration’ of the details of the text. He was perfectly happy to have his verse sung, even if the poem’s meaning or structure was contradicted by the music. Partly that may reflect the music of his time: in the 1550s French song-setting was pretty conventional. not till Lassus and the 1570s did the madrigalistic style of word-painting really take off. Ronsard’s enthusiasm for Lassus perhaps reflects the new, closer link between the words and music which his approach was making possible. At any rate, we can be sure Ronsard enjoyed his poems being sung: he tells us frequently how he sung them to himself, and he advises poets to use this approach when reviewing the effectiveness of their verse. In general, though, Ronsard’s views on music – though much discussed – read to me as very conventional; an outsider’s view rather than an insider’s, a non-musician’s rather than a composer’s. Ronsard has little of any real practical application to tell us; instead, he functions in broader, ‘philosophical’ terms. For instance, Ronsard made much of masculine & feminine endings, as structurally important to the music. This is reflected in the ‘standard’ settings in the Supplement, but also in the way Ronsard structured his Odes increasingly in standard metrical forms (and ‘removed’ poems which lacked the repeating structure which would make them ‘musical’). But in reality, a composer can set prose to music if he wants: the things which obsessed Ronsrad are applicable only to strophic, repetitive settings, which in turn are about the external features of the poem not the ‘illustration’ of its meaning or its vocabulary. There are plenty of references to singing the poems (especially Odes) to the accompaniment of a lute. Maybe this is a classical trope, but there is a general sense that Ronsard did take up a lute and accompany himself in however rudimentary a fashion, and that music can enhance the sensations or impressions created by the verse. I’m sure that, for Ronsard, being able to hear and understand the words was the most important thing! Consequently it’s odd that almost all the settings we have are polyphonic settings for 4 or more voices. The text is often sung by different voices at different times, overlapping with one another – so that the music not the words takes the lead. But let’s qualify that: in the French style, homophony/chordal sections (with all the voices in step) often make up the bulk of the song, with true polyphony only being used in an ‘illustrative’ way (overlapping runs of notes for laughing, singing, weeping, etc). And even when polyphony is more prevalent, art music need not have been so far from what Ronsard would have expected or preferred. After all, a song in 3 or 4 parts can be sung by just one voice with an accompaniment, making the words crystal-clear; there is both contemporary evidence and modern performance practice to reflect this approach, as well as that of using a small choir. (Here’s an example I’ve stitched together from various recordings to illustrate it.) And there is also evidence for the ‘top lines’ of art-music songs being taken out of those songs and sung as a popular tune – we can find Ronsard settings in the so-called “voix de ville” or “vau-de-ville” (‘voices of the town’) collections which borrow their tune from a known chanson. After a brief flirtation with madrigalistic settings in the 1570s, the style typified by La Grotte begins to take over – a top line with accompaniment, rather than true polyphony in the sense of several equally-important lines taking the lead at different times. So to summarise: Ronsard liked hearing Lassus, perhaps because he emphasised the meaning of the words, but not at the expense of beautiful music; he liked poems sung to the lute; and he (probably) liked the French chordal style, which again let the words lead. All three give the words, in their different ways, priority. All three also conferred popularity and sing-ability upon the poems set to music. And that may be at root all that Ronsard sought.